Fiery eyes of the beast with a slit pupil surrounded by red with a yellow sunburst. Would you like to have eyes like a dragon? These ColourVue Dragon Eyes contact lenses are just the thing! Dragon eyes contact lenses are ideal for Halloween and costume parties. 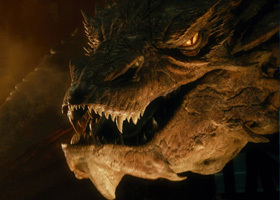 With them you can turn yourself into Smaug - the gold loving dragon from The Hobbit. They provide an amazing, very striking effect which will go well with any dragon/devil/monster costume. Mesmerise your friends with your dragon-like eyes!